Your challenge is to complete your work by the closing ceremony of the games (August 24th)! You’re only competing against yourself and what you choose to make is up to you. 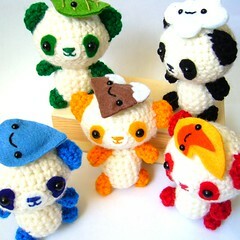 Your items should be some kind of challenge though – it’s not impressive to complete a 1hr amigurumi in the next 17 days! OMG I CAN DO THIS… I’ve been training my whole life for this event. 😉 I am going to compete in the Crocheted Cabling Event, as well as the Giant Granny All-Stars Spectacle. Well ME of course! :)! I will make grannysquare-purse with bamboohandles!